This Highlands Falls Country Club home for sale is located at 31 Eyebrow Ridge. The 4 bedroom, 4.5 bath home is situated on a lot that is just under an acre in size in one of the area’s most sought after communities. The Highlands Falls Country Club boasts a breathtaking golf course. In addition there is a state-of-the-art fitness center, a pool, croquet lawns, tennis, pickle ball, and a fabulous clubhouse among its amenities. Membership to the club is possible with the purchase of this Highlands home for sale but not mandatory. 31 Eyebrow Ridge sits on a corner lot with a great mountain view. Privacy and serenity are yours in this outstanding location. The driveway to the home is lined with low maintenance yet beautiful landscaping. 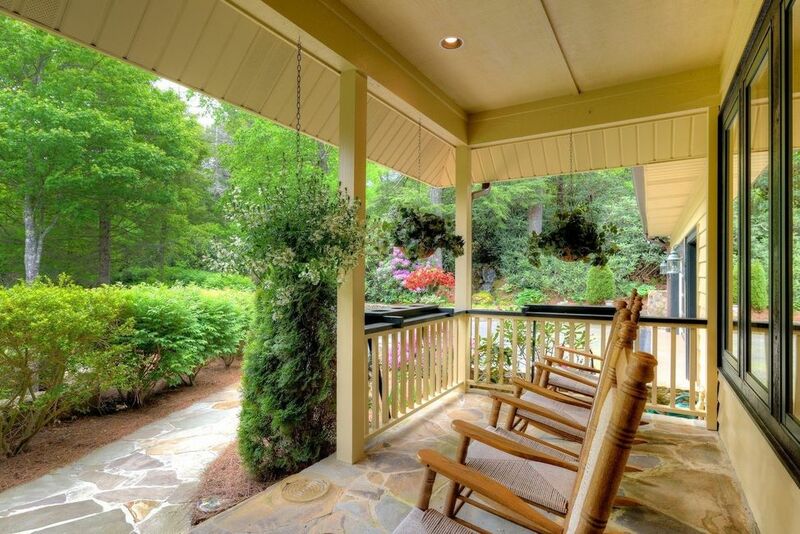 Upon arrival you are greeted by a rocking chair front porch. Once inside you are greeted by a beautifully maintained home. The living room boasts high wood ceilings with beautiful beams, a stone fireplace, and a wet bar. The two large covered, screened porches provide additional entertaining space as well as perfect spots to relax with a morning cup of coffee or perhaps curl up with a great book. The kitchen is fit for a chef, complete with a butler’s pantry between it and the doing room.. Between the kitchen and the dining room is a butlers pantry. The lower level is spacious, with additional living space that includes a large family room with a corner fireplace. Here you will also find two guest suites which open to the lower deck, and a bunk room with a half bath. There is a game room, complete with a pool table, above the garage. This home is being offered fully furnished. Contact our team at Berkshire Hathaway HomeServices Meadows Mountain Realty today to schedule a private showing of 31 Eyebrow Ridge. We welcome the opportunity to help you conduct a successful Highlands property search. Let our knowledge and experience serve as your guide to the buying process, locating the ideal Highlands Falls Country Club home for sale or perhaps a home in another community.